At ICRAVE, we like to work across scales. At any given point, our studio is simultaneously diving into the interior design of a restaurant, curating an event, and development urban masterplans. Our strategic work has always focused on reinventing and reinvigorating our client’s visions into groundbreaking ideas. With a focus on cracking what’s at the core of every experience, we tap into other disciplines to find the opportunities that fuel our client’s visions to make the human experience across sectors way better. Throughout the past decade ICRAVE has applied its expertise in hospitality and experience design to help developers plan better cities and neighborhoods around the world. Our team of strategists works towards providing a robust set of physical, operational, and digital solutions that add value to both existing and future developments. Our approach focuses on identifying unique opportunities and crafting purpose through a thoughtful story that physically manifests the brand values it believes in. In this dynamic collaboration between with Summit, ICRAVE created a robust strategy for the company’s mountain town community in Utah’s Powder Mountain – the nation’s largest ski resort. With a comprehensive brand strategy, seasonal programming, and one-of-a-kind urban plan, we were able to define and celebrates Summit’s culture. 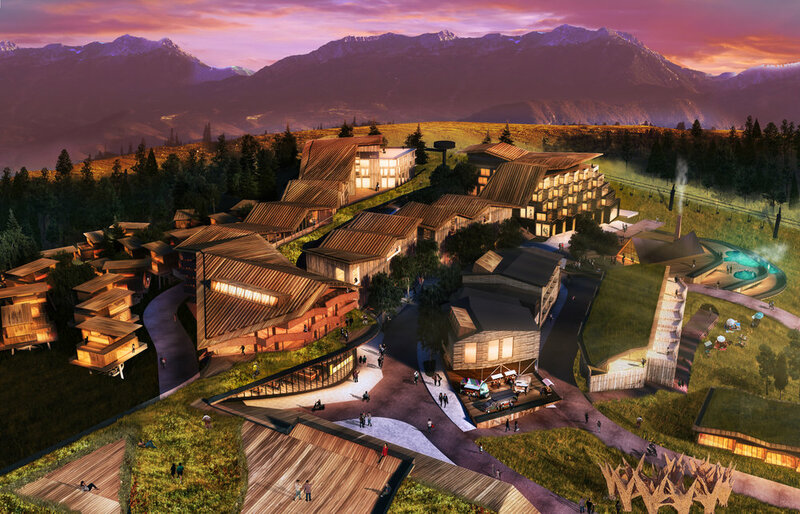 Our solution set vertically integrates commercial spaces, work zones, residential units, and hotels to a state-of-the-art ski ramp that allows future Summit Powder Guests to revel in nature and connect to each other. When the developers for Lemon City reached out to the ICRAVE team, the site consisted of continuous urban acreage. Our vision was to build innovative urbanism that was attractive to Miami’s creative class without isolating neighboring communities. 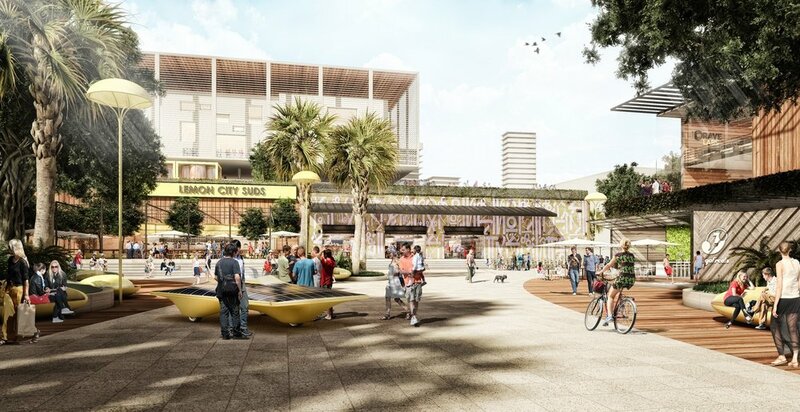 Our proposed program mix was designed to celebrate Miami’s culture, inspire creative living, and enable daily life to its residents. For this high-profile urban retail development in the heart of Mid-town Manhattan, our team’s goal was to design for an intimate neighborhood feel and solve for a complex urban complex that included multiple city blocks, large retailers, and public gathering spaces. We looked at small European town’s for inspiration and proposed a set of solutions that broke down the experience into our guest’s experience where they could become fully immersed in through art curation, integrated technology, and day-to-night programming. 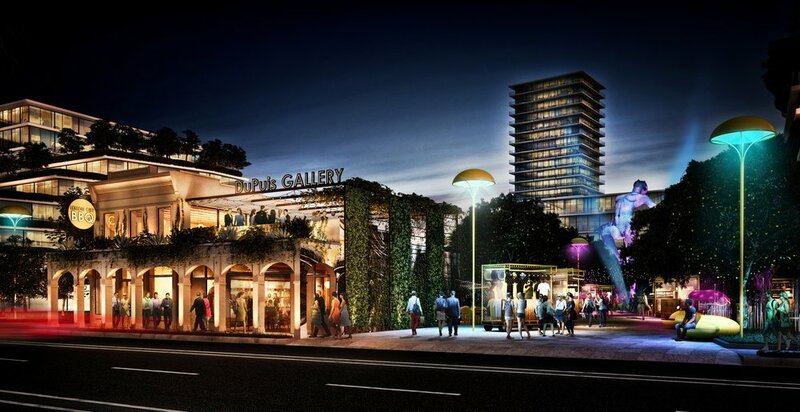 Our task was to design a strategy that would help create a vibrant neighborhood in the heart of Tel Aviv. Our strategy revolved around the user experience of three main stakeholders – the tower’s residents, neighboring locals, and visitors. Our key objectives where to create an active streetscape, promote a sense of discovery, and cater to the cult through niche driven destinations. We proposed a set of physical solutions that transformed the existing design into a opportunities for the guests to connect with each other and trigger the kinds of memories that foster and encourage community and a sense of place – comfort, wonder, discovery, and familiarity. Over the past decade, ICRAVE has transformed the airport experience across North America - our vision, create spaces that empower, entice, and inspire travelers and increase profitability for our clients. 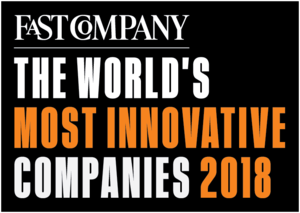 Our award-winning designs have helped propelled operators into the sector, setting them apart from the competition through innovative concept that disrupt the traditional model. Our holistic approach focuses on turning wait times into new revenue streams. By bringing state-of-the-art technology, a curated, local, food program, and bold designs, travelers can hold the airport experience as one that inspires and delights. Our healthcare strategy work focuses on understanding our client’s patients, finding opportunities to better their experience, and amplify this solution set through strategic designs. Our work with Memorial Sloan Kettering, HSS, and John’s Hopkins crystalize our mission to create patient-centric centers that transform the current healthcare model into one that is more engaging and supportive. We approach each curatorial project with the goal of crafting a story that people can connect to. Beyond the traditional exhibit model, we like to position each project within a holistic narrative and design the guest experience, the space, and the brand that sets it apart. Vayner Media, Edible Manhattan, and ICRAVE collaborated to create Food Loves Tech’s first expo. Our team was tasked to create a holistic experience that was iconic, engaging, and future forward. Knowing that this was the event’s first year, we focused on designing place-making tactics that could mold with time and adjust to future venues. Our goal was to craft a memorable story about the current and future state of food through four distinct galleries that enabled guests to engage in every exhibit and offer playful opportunities to learn and discover something new. Our scope of work included curation, experience design, interior design, and branding. Our team has focused on re-invigorating the retail market with fresh new concepts that defy the status quo and promote a more dynamic program mix fit for today’s discerning palates. 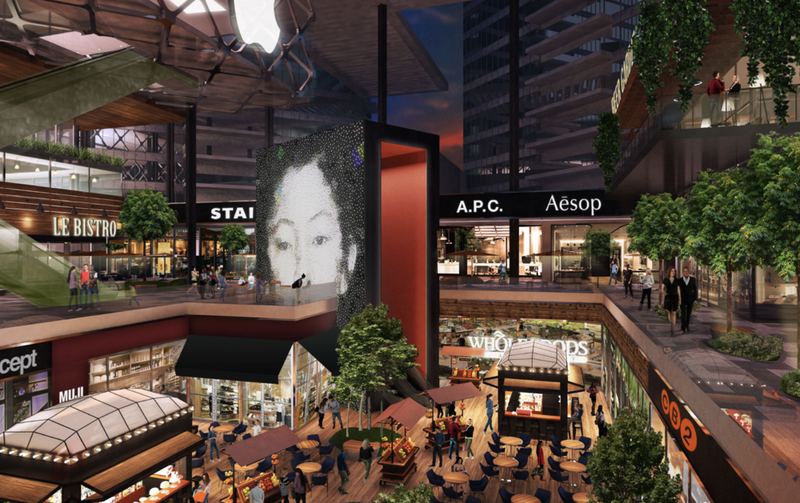 We work with developers, architects, and retailers to create spaces that add value to their properties, attract critical mass, and position their assets iconic urban destinations. We developed “The Future of Retail” as a response to the current pit-falls facing retail. In the last 10 years, the shelf-life of stores has decreased, resulting in the explosion of pop-up shops and online shopping. Our team focused on methods that would re-invigorate traditional retail concepts by rethinking the physical make-up of shops and ways to integrate technology. Our vision proposes transient experiences, that are curated, sensorial, and dynamic. Our goal is to blend art, culture, entertainment, and technology to create something that is truly aspirational and sought after – and just as addictive as our social media feeds. To reinvigorate the property’s public spaces our team envisioned a robust program that blends fitness, food, and programmable event spaces that are exciting and fresh. With an iconic design approach, our team was able to merge functionality and design to create an inviting, unexpected, and playful space. 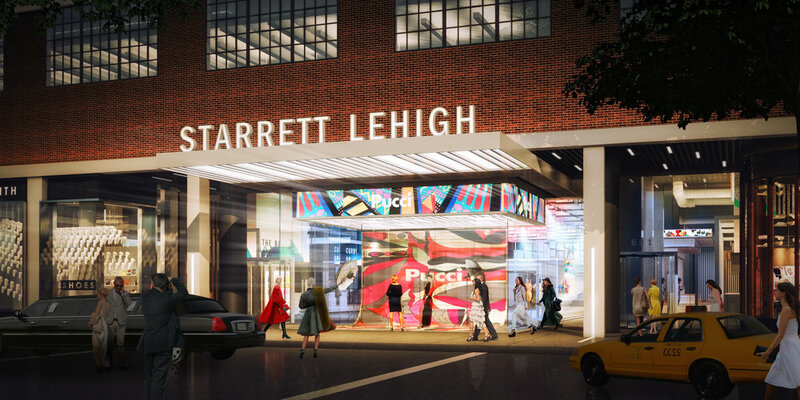 Over the past couple of years, we have worked closely with RXR and HLW to create a new retail typology for the iconic Starrett Lehigh building. Since the project’s onset, our goal was to create an icon that fostered discovery amongst its guests through food, art, and entertainment.